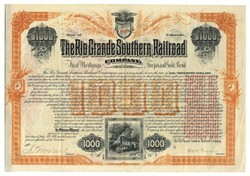 Beautifully engraved bond certificate from the Rio Grande Southern Railroad issued in 1890. This historic document was printed by the Homer Lee Bank Note Company and has an ornate border around it with a vignette of a train and a cherub. This item has the signatures of the Company's President, Otto Mears and Secretary. 38 coupons attached on top. The Denver and Rio Grande Railroad (D&RG) had built branch lines to the mining towns of Silverton and Ouray, but the San Juan Mountains between Ouray and Silverton were too formidable to allow the building of a railroad directly connecting the two towns. The Silverton Railroad, built north from Silverton, had reached within 8 miles (12.9 km) of Ouray, but the remaining stretch through the Uncompahgre Gorge was considered too difficult. A cog railway was briefly considered but was never built. The RGS was founded in 1889 by Otto Mears, and construction began in 1890 from Ridgway (north of Ouray) and Durango (south of Silverton) to go around the most rugged part of the San Juan Mountains and also reach the mining towns of Rico and Telluride. The line was completed only a little time before the Silver Panic of 1893 which resulted in most of the mines closing overnight and the railroad losing most of its traffic. The railroad struggled to survive through the Great Depression, and was finally closed in 1951. The RGS filed with the Interstate Commerce Commission for abandonment on 24 April 1952. As the Rio Grande Southern was never a wealthy railroad, its locomotives were all second (or more) hand, mostly from the Denver and Rio Grande/Denver and Rio Grande Western, which owned the RGS during most of its history. Most of the locomotives that came to the road were old and heavily worn, some having been pulled from the scrap line and pressed into RGS service. The road only had one car built new for itself. In later years, most of its freight cars were retired cars from the abandoned Colorado and Southern 3 ft (914 mm) narrow gauge system. Today, much of the former D&RG and RGS rolling stock has new life in tourism, including the Western River Railroad and Knott's Berry Farm railways, as well as the Silverton Train (which has been in continuous steam service since 1881) and the Cumbres & Toltec Scenic Railroad. The Knott's Berry Farm trains are maintained with their original colors and railroad identification. The right of way can be traced by going west from Durango to Mancos on Rte 160, then to Dolores via Rte 184, north across Lizard Head Pass (10,222 ft or 3,116 m) to Placerville using Rte 145, with the final leg Rte 62 to Ridgway. The route passed over Dallas Divide west of Ridgway and over Lizard Head Pass north of Rico. The most famous structure on the route was the Ophir Loop near Ophir. At this point the railroad was built up a narrow mountain valley and looped back up the other side to gain elevation over several tall trestles. A famed aspect of the RGS was its fleet of Galloping Geese. During the Great Depression increasing operational costs made it expensive to operate trains over the mountain railroad. The RGS devised a rail car from Buick and Pierce-Arrow automobiles or bus front ends and a box car rear end. Seven Geese were built for the RGS, and all but one survive today. A Goose was built by RGS for the San Cristobal Railroad in 1933. It was returned to the RGS in 1939 and dismantled, with parts going to rebuild Goose #2. The Goose at Knott's Berry Farm still operates in the function it was designed for�to run a cost-effective rail service on days when demand does not require full-size trains (mostly weekdays during Fall, Winter and Spring in this year-round theme park). All six original Geese and the reproduction No. 1 are operational. The last non-operational Goose, No. 4, was restored to operation in August 2011 by the volunteers of the Ridgway Railroad Museum and the Telluride fire department. Otto Mears (May 3, 1840; June 24, 1931) was a famous Colorado railroad builder and entrepreneur who played a major role in the early development of southwestern Colorado. Mears was known as the "Pathfinder of the San Juans" because of his road and railroad building projects through Colorado's San Juan Mountains in the late 19th Century. He built hundreds of miles of toll roads in the rough terrain of the young state of Colorado, notably the Million Dollar Highway over Red Mountain Pass, connecting Silverton to Ouray. Born in Russia of Jewish parentage to a Russian mother and a British father, Otto Mears was orphaned when young. He was sent as a boy to the United States to live with relatives who had emigrated there, and sailed to San Francisco. Mears served in the California Volunteer Infantry during the Civil War. Later Mears worked the gold fields of California before settling in Colorado, where he would make his name. He initially settled in Conejos County in Colorado Territory, but soon moved to Saguache, Colorado, then to the San Juans. A wheat farmer in Saguache, Mears first built a road over Poncha Pass to gain access to the flour mill at Nathrop, which served the Leadville market. Mears told a story many times in his life that his decision to become a road builder followed an encounter with William Gilpin, former Territorial Governor of Colorado, on Poncha Pass while struggling to bring his flour to market over the poorly built road. He applied to the Colorado legislature for toll road charters for his roads and built the roads in conformations and at grades suitable for railways. His routes over Poncha Pass and Marshall Pass were purchased for road beds by the Denver and Rio Grande railway. Mears built several railroads during his 91 years, including the Rio Grande Southern Railroad from Durango to Ridgway, the Silverton Railroad, and the Silverton Northern Railroad. Several of his railroads were narrow gauge. From 1888 to 1892, Mears issued special railroad passes to dignitaries and friends to allow them to ride free on any of his lines. Some of these rare passes were made of silver or gold and are now highly prized collectors' items. In 1876, the state legislature selected Mears as one of Colorado's three presidential electors supporting Republican Rutherford B. Hayes. In the 1880s, Mears was elected to the Colorado legislature. The panic of 1893 reduced the value of his investments. He had to sell much property and lost control of his railroad holdings. Mears moved to the East Coast and became involved in railroad and manufacturing ventures there. One of his most successful railroads on the east coast was the Chesapeake Beach Railway, which ran between Washington DC and southern Maryland. The dome of the Colorado State Capitol building was originally covered in copper. After the weather tarnished the copper sheathing, Mears suggested covering the dome with gold. He persuaded the Colorado Mining Association to donate 200 ounces of gold for the project, and by 1908, the dome's first gilding was complete. Otto Mears died on June 24, 1931 in Pasadena, California.